While some of Korea’s most popular male idol groups like Dong Bang Shin Gi and Big Bang remain away from the Korean music scene in order to focus on individual pursuits, the influx of new groups taking advantage of the situation (such as B2ST and MBLAQ) seems to be continuing into 2010. Star Empire Entertainment, which manages the female idol group Jewelry, introduced their latest production, Children of Empire (力惫困酒捞甸) on Jan 7 with the release of Nativity. 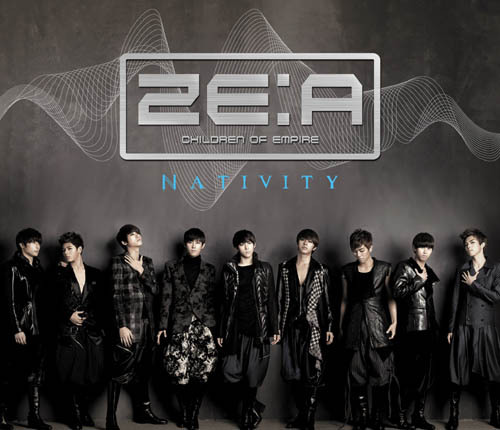 Also known as ZE:A, the group faced controversy prior to their debut due to complaints by fans of the ever-popular Brown Eyed Girls that their names sounded far too similar, and could be confused with the girl group’s member, JeA. Naming controversy aside, the group’s debut was also a long time in the making due to Star Empire Entertainment’s financial difficulties. In an effort to gain fans prior to their official launch, the group performed on the streets. However, the 9-member group finally held its official debut showcase on Jan 13 at a club in Kangnam, Seoul. In a show of support for their label-mates, Jewelry’s Seo In Young and Park Jung Ah hosted the event. According to various Korean news portals, the group performed songs such as “Love Coach” and “Mazeltov” from their debut album, Nativity. They also performed “Billie Jean” as a tribute to the King of Pop, Michael Jackson. ZE:A reportedly entertained the 150 fans amongst the audience present at the showcase through their “nice choreography and brilliant vocal performances”. The group does seem slated for success, with their efforts paying off to a strong start for their career. Already, they’ve signed a contract with the mobile phone company, Sky, and filmed a commercial endorsing the Jamband phone, which was released just weeks after their official debut. Mazeltov, which is an expression of congratulations in Yiddish/Hebrew, is the clear stand-out track in their latest release. Though the music video for the song was criticised for being unoriginal, with the dark, manliner-ed look being too similar to SS501’s “Love Like This” and 2PM‘s “Heartbeat”, it did the job of establishing a link between these more popular groups and ZE:A as a player in the industry. The song follows the latest trend of ‘hooks’, making it catchy and easy to remember. This is done through an electronic feel, an addictive bass and repetitive lines such as “Friday Saturday Sunday”. However, MTV Iggy criticised the song for having such heavy autotunes that the boys’ original voices become difficult to hear. For those with other tastes, the single includes a dance track (Love Coach) and an electronic RnB track (New Star). Overall, this single receives 2.5 UrbanWire stars.